The charge “anti-Semitism” is thrown around loosely by defenders of Israel as a way to discredit legitimate criticism and sometimes even the expression of inconvenient facts as happened recently regarding a map showing the steady erosion of Palestinian land, writes Lawrence Davidson. For the past few weeks, those taking local trains from New York City’s wealthier suburbs into Manhattan have encountered a succinct billboard history of the Israeli-Palestinian conflict. 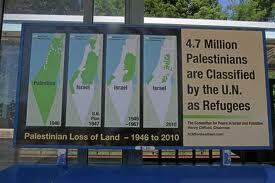 The lesson comes in the form of four aligned maps showing the absorption of Palestinian land by Israel from 1946 to the present, along with a declaration that “4.7 million Palestinians are classified by the U.N. as refugees.” In all respects, the ad is historically correct. This educational billboard was made possible thanks to the efforts of Henry Clifford, chairman of the area’s local Committee for Peace in Israel/Palestine who purchased the billboard space to educate readers on what really is happening under the Israeli regime of occupation so generously supported by U.S. dollars. Immediately the ads were labeled “anti-Semitic” by area rabbis and Jewish community leaders. Three things are to be said about Mr. Efune’s reaction: 1) He seems not to care that the map display and UN statistic are accurate and what that means for the lives of millions of people. 2) No doubt quite inadvertently, he does infer that what the ad reveals is criminal behavior. 3) If there is any truth to the assertion that “when people think of the Jews they think of the Jewish state” it is because Zionist propagandists have, for over 64 years, incessantly insisted on that identification. Those Jews who have publicly denied the connection between Judaism and Israel have been abused and libeled. So, to the extent that Jews in general are identified with Israel’s “committing a crime,” you can thank the Zionists for that. Rabbi Joshua Davidson (no relation to me), the senior Rabbi of Temple Beth El in northern Westchester, New York, says the map ad presents “a distorted and skewed view of a complicated conflict.” Actually, that is untrue. The ad simply puts forth historical truth. In addition, the conflict really is not as complex as Zionists say it is. It is the consequence of a rather straightforward, post-World War I, imperialist land grab that, in the case of Palestine, is on-going even now. It was and continues to be justified by religious mythology on the one hand and the history of anti-Semitic persecution on the other. The land grab was originally abetted by the British imperial politicians, some of whom imagined that they were helping to fulfill biblical prophecy, and others who saw a Jewish homeland in Palestine as a way of solving the “Jewish problem” in Europe. The Palestinians, being seen as inferior natives, were then and are now, still pushed aside. Also, like the statement of Dovid Efune, Dayan’s argument is logically confused. He is claiming that the hyperbolic rhetoric of Arab leaders in the run-up to the 1967 war somehow frees Israel from its obligations as a signatory to such international treaties as the 4th Geneva Convention. Article 49(3) of that treaty prohibits an occupying power from “transferring parts of its own civilian population into the territory it occupies.” Successive Israeli governments, both of the Left and the Right, have energetically violated that law by transferring civilians into these conquered lands. Where did he get that right? From his god? From very ancient history? From the fact he walks about the area with an Uzi submachine gun strapped over his shoulder? There is certainly no basis for it in international law. Dayan presents these illegally accomplished facts on the ground as “irreversible” and the two-state solution to the Israeli-Palestinian conflict as “unattainable.” He challenges his readers to understand the “realpolitik” truth of his position. And, according to Richard Falk, United Nations Special Rapporteur for Palestinian Human Rights, it is hard to “doubt the force of Dayan’s reasoning on this central issue.” Well, if not settler leader’s reasoning, which is faulty, then certainly one cannot doubt Israel’s physical possession of increasing amounts of Palestinian land. Apparently, the governments of the world have capitulated to Dani Dayan and vigilante squatters. Hamas, which would gladly defy them, is confined, also with international blessings, to Gaza, the world’s largest outdoor prison. Thus, there is no military presence on the ground that can gainsay Mr. Dayan. So what does this imply, that might makes right? Is that Mr. Dayan’s version of Israel acting as a “light unto the nations”? Apparently so. Colonialist ventures can be defeated in more than one way. The “usual” way is through prolonged and bloody armed struggle. Thanks to the world-class military machine the United States has helped Israel create and maintain, this is not a likely path to success. But such regimes have also been forced to transform themselves into more equitable, more democratic, and less repressive ones through concerted outside pressure. And such pressure is now as real and growing as Dayan’s squatter movement. A major effort at outside pressure is the worldwide BDS (boycott, divestment and sanctions) campaign against Israel. Ilan Pappe, an Israeli-born professor at Exeter University in England, notes that this “campaign’s elasticity has made it into a broad process powerful enough to produce a new public mood and atmosphere.” As someone who has spent the last 35 years espousing the Palestinian cause, I can testify to the truth of that statement, even here in the United States. It might very well be that Israel is here to stay. But that does not mean that it will always be the racist, oppressive society it is now. Consistently applied outside pressure, growing in scope and strength, can wear down support for ideologues such as those of Dani Dayan and his backers both in and outside of today’s Israel. It can, slowly but surely, convince ordinary Israelis that they have a choice: go along with their expansionist leaders and face increasing international isolation or, as Pappe puts it, cooperate willingly in “finding a formula for joint living” that is, creating a better society that is tolerant and mindful of the need for justice, first and foremost for Israel’s victims, the Palestinian people. Also a nation that can be trusted to honor its obligations under international law. It should be clearly understood that it is not just Israel’s future or that of the Palestinians that is at stake here. All of us have to ask what value we place on international law. What value do we place on a world that recognizes the primacy of law born of sane human reason, rather than religious mythology, apocalyptic fantasies, and tribal nationalism? It is all wrapped up together; as goes the Israeli-Palestinian conflict, so goes the viability of international law.